This beer is fantastic! I'm a big fan of beers with a big hop presence, and the Smuttynose IPA is my new favorite. 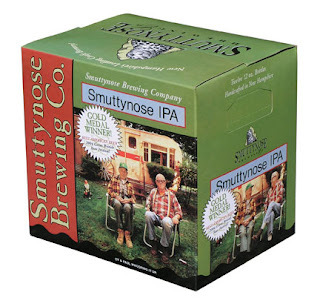 Smuttynose Brewers in Portsmouth, NH is mostly a regional brewer. Their products are generally available throughout New England, and can be found in fine establishments up and down the east coast. Their IPA, nicknamed the "Finestkind IPA" is one of their signature, year-round products, and it clocks in at 6.9% ABV. It has a very crisp flavor and a light color, but the real story is in the hops. Apparently, only American hops are used in this beer, and the result is simply terrific! There is a significant citrus flavor in the hop taste, and something very surprising: the taste of tobacco. The unique combination of the hops in this beer gives both an astringent taste and the presence of tannins from the hops. This adds an amazing amount of flavor and character to a solid beer. i've never had this particular smutty nose, but i think i'll give it a whirl this weekend now..